Least Common Multiple (LCM) is an important and simple topic that students learn in their primary school. Instead of understanding the LCM concept, the students focus mainly on the techniques to find the LCM for a given pair of numbers. Without understanding the concept, students, at a later stage, fail to appreciate why LCM needs to be used when solving certain type of problems and puzzles. So understanding the concept is very important for the students to appreciate and apply the concept of LCM in practice. And when it comes to understanding the concepts, visualization methods come handy. Don’t we know “A picture is worth a thousand words”? So let’s explore one such visualization method to understand the concept of LCM. And when it comes to understanding the concepts, visualization methods come handy. Don’t we know “A picture is worth a thousand words”? So let’s explore one such visualization method to understand the concept of LCM. Let us take two numbers 8 and 12. And try to understand what the LCM of 8 and 12 really means. Consider a rectangle with length 12 units and breadth 8 units, as shown below. Now, let me create a small puzzle for you. You need to use one or more of the above rectangular piece to make a perfect square. But you have to use the least number of pieces. Ae you ready? Come, let’s solve it. Cut out a few rectangular cardboard pieces of size 12 units by 8 units, and start arranging them. You will quickly figure out that you need just 6 pieces to form a perfect square shape as shown below (Figure 2). What do you think would be the length of each side of this square? Did you say “24”? Well, that’s absolutely right!! 24 is in fact the LCM of 8 and 12. So the above puzzle was just a simple problem of finding out the LCM of 8 and 12. The puzzle was a way to make us understand the visual meaning and concept of LCM. The LCM of two given numbers is the length of the smallest square that can be constructed using one or more rectangular pieces whose length and breadth are the two given numbers. A very simple concept. Isn’t it? Now that we have understood the concept of LCM visually, let us see how this helps in appreciating and applying the concepts in real problems and puzzles. That is what the article claimed in the beginning, right? Let us look into addition of unlike fractions. During my teaching experience, I found kids quite good at adding “unlike fractions”. But they were solving it very mechanically, without really understanding why they have to take the LCM of the denominators while adding “unlike fractions”. So I used the visualization method to make them understand the concept of LCM. And I found them grasp the concept quickly, and also appreciate why they have to use LCM while adding “unlike fractions”. Let us see how the above visualization method helps us in appreciating the use of LCM in adding two “unlike fractions”. Let us initially start with “like fractions” by taking a simple example of adding of two “like fractions” 1/4 + 2/4 . Consider a square of length 4 units. FIGURE 3: Addition of two “like fractions”. 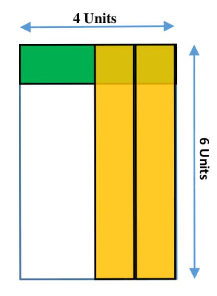 The green bar represents the fraction 1/4 (since we can fit 4 green bars of width 1 unit vertically in this rectangle) The yellow bars represent the fraction 2/4 (since we can fit 4 yellow bars of width 1 unit horizontally in this rectangle). Since the green bar and the yellow bars are of the same size, we can add them to get 3 bars in the square of length 4 units. Thus 1/4 + 2/4 is equal to 3/4. Now when we deal with “unlike fractions”, for example 2/4 + 1/6 , the situation is a little different. Consider a rectangle of length 4 units and breadth 6 units. FIGURE 4: Addition of two “unlike fractions”. 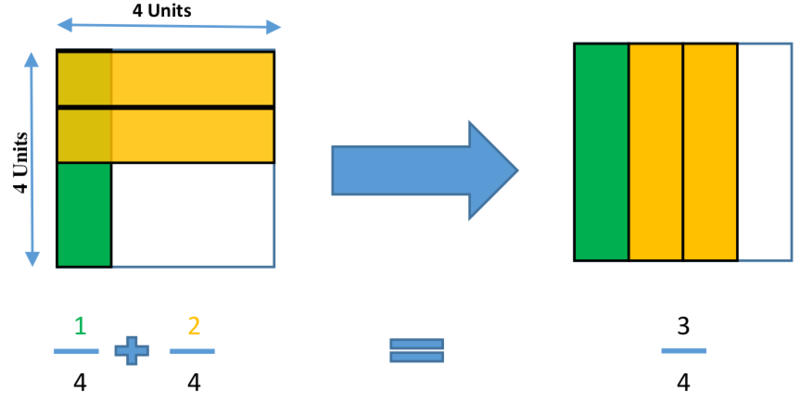 The green bar represents the fraction 1/6 (since we can fit 6 green bars of width 1 unit vertically in this rectangle). The yellow bars represent the fraction 2/4 (since we can fit 4 yellow bars of width 1 unit horizontally in this rectangle). Since the green bar and yellow bars are of different sizes, we cannot add them directly. From the addition of “like fractions”, we know that we need the green and yellow bars to be of the same size to quickly add them. And that’s only possible if we have a square. Since we have a rectangle, we need to make a square using these rectangles. Obviously, we need to make the square using the smallest number of these rectangles. Hold on. Doesn’t this problem sound very similar to the puzzle we solved while understanding the concept of LCM? Yes, let’s solve it. 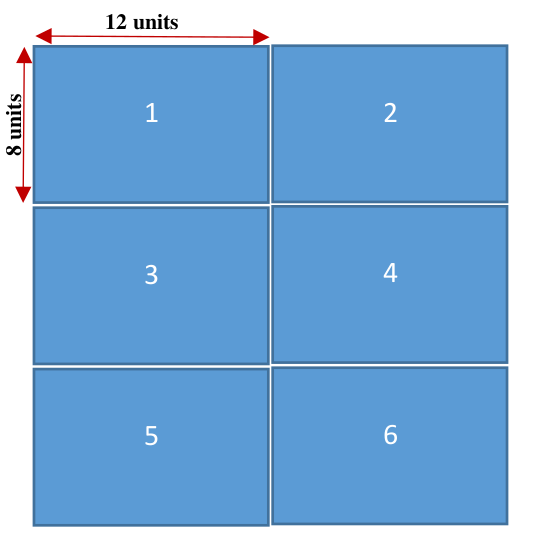 FIGURE 5: Making a square using 6 rectangles of size 6 by 4 units. By using six such rectangular pieces, we made a square as shown above (Figure 5). 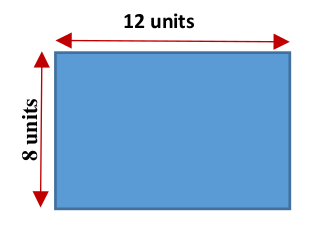 The length of each side of the square is 12 units. If you observe, we have 6 yellow bars and 2 green bars. Since all the bars are of the same size, we can add them directly. And thus we get the answer as (6+2)/12 = 8/12. Thus 2/4 + 1/6 is equal to 8/12 . So when modelled mathematically, adding two “unlike fractions” is similar to the LCM puzzle. That’s the reason LCM is used while adding two “unlike fractions”. So obvious now, right? Consider another puzzle. Say, you have a brick of length 1 unit, breadth 2 units and height 3 units. How many bricks would you need to make the smallest possible cube? Do you see any similarity here compared with the puzzles we talked about in this article? Can you solve this puzzle using the concept of LCM?